I've been meaning to post a blog from the camping trip we took a few days after Jonathan's 7th birthday. The weekend of 19-20 August, Jonathan, Kaitlyn and I packed up for a camping trip on the Maryland side of the Potomac River. 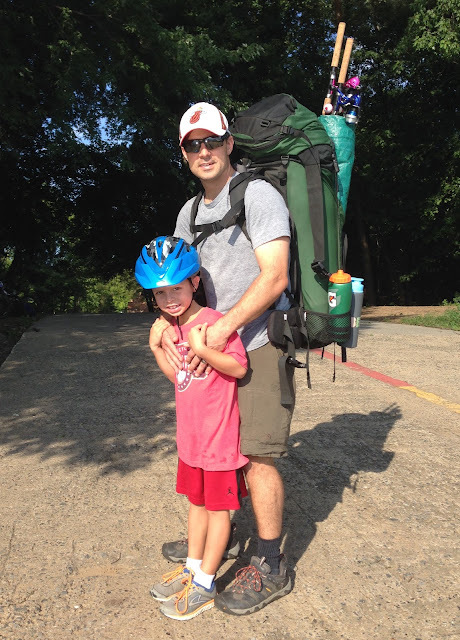 We planned to camp along the Chesapeake and Ohio (C&O) canal, where campsites are first come, first serve and hike-in/bike-in only (you access the sites by trail, no vehicular access). So in addition to our camping gear, we loaded 3 bikes on the car and started our journey. We took White's Ferry across the river, which is always a treat for us, and drove another 20 minutes to the parking lot. Here's a pic of the ferry coming back to the Virginia side of the Potomac to pick us up. This thing always reminds me of a scene from one of the great Clint Eastwood movies, the Outlaw Josie Wales. Getting ready to unload the bikes, throw on the backpacks (1 for each of us), and take the 7 minute bike ride to our campsite. I was happy the little Jetta passed the test...I can hold off on that Jeep for a few more years. A quick stop to check out the boat ramp and a photo op for the boys. There was another group at the campsite when we arrived but luckily there was plenty of room to accommodate both of us. I got the tent setup while the kids started gathering firewood. You can see the Potomac River in the background. Kaitlyn was inside the tent pumping up the inflatable mattress, which we used since it took up less space than 3 sleeping bags. After gathering plenty of wood, we made our tee-pee and I let Jonathan set it ablaze. The kids did their best to get the firing started on their own. Jonathan was pleased with his work. We managed to make time for a little fishing before dinner and both kids reeled in small bluegill. I love this picture as it shows Kaitlyn's true feelings towards the fish...not sure what she had against the little guy. Jonathan wanted to throw his little fish on the fire but I talked him into letting this one go. We had hotdogs over the fire for dinner and enjoyed s'mores for a treat afterwards. Jonathan was so tired that I basically talked him into a s'more before bed. J was asleep before 9pm and K was just about asleep when she heard thunder roll through. For those who know Kaitlyn well, you know she's going through a phase where she's terrified of storms. Even though I checked the weather several times over several days to make sure the weather was good, we still managed to have a small storm pop up unexpectedly. I checked the weather app after we heard the thunder and it called for a 30% chance of thunderstorms. With that info, and Kaitlyn's fear, we packed up all the small items as quickly as possible and headed home. Poor Jonathan was such a trooper, he woke up, got dressed, threw his backpack on, and biked back to the car without complaining once. Kaitlyn was far more concerned during the bike ride back, especially after we heard thunder one or two more times. I think the worst part was biking through the woods at night with a headlamp and lantern as the only light around (it was dark!). Anyhow, we drove back to the ferry (luckily it runs until 11pm) through a pretty decent storm and made it home by 10:30pm. The next morning I headed back to the campsite to pack up our tent and I was happy that both kids wanted to join me....we had unfinished business. In hind sight, it was a great idea to leave the tent behind as we would have definitely been caught in the rain/storm if I had packed it up. Heading back to the campsite Sunday morning. Here's the bike trail to our campsite...picture this trail in the dark at 9:30pm with a scared little girl. Fun times. I was just hoping we wouldn't see eyes looking back at us during our night ride. After breakfast at camp, the kids wanted to fish a little more since we had a few worms left. Jonathan reeled in a nice catfish to get the morning started! During the drive back, we saw a box turtle crossing the road so we decided to help him out. They say to always place the turtle in the same direction they were traveling before you moved it. Easy enough. 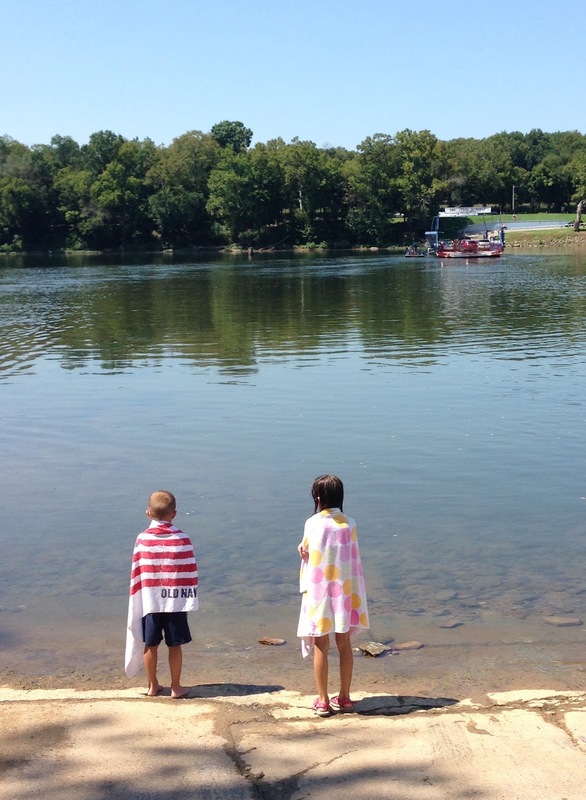 We spent about an hour splashing around at the boat ramp on the Potomac before we called it a day and took ferry back to Virginia. It was a great evening and morning with a quick trip home to spend the night. Just a matter of time until we go back to this campsite.